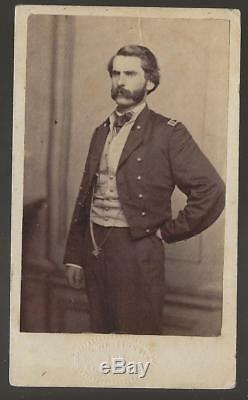 CDV of Colonel John Lowrie McGee, served as a Captain in the 1st West Virginia Cavalry 10/61-2/262, promoted to Major of the 3rd WV Cav, 2/62 rising to Colonel and mustering out 6/65. The Third West Virginia Cavalry was organized in the spring of 1862, with David H Strother, lieutenant-colonel; John L. McGee, major and Barna Powell, adjutant. Lieutenant-Colonel Strother had a national reputation as an artist and litterateur, and was among the first in this country to illustrate his own literary productions of Southern life and events, prior to the war, in Harpers Magazine under the nom de plume of Porte Crayon. During the first two years of the regiments service in doing guard and scouting duty by company detachments, which were stationed from the Shenandoah to the Kanawha Valleys; during this time Colonel Strother was performing special service on the staff of General Averell, Sigel and Hunter. Colonel McGee had seen much active service in the war prior to his promotion into the 3rd Cavalry Regiment. He also served as chief of staff with General Milroy. On the 18th of July, 1861, Company A, 1st West Virginia Cavalry, recruited and mustered in at Morgantown, W. Was the first cavalry organization raised in the State; it was mustered into service as the Kelley Lancers, J.
McGee, captain; and at once reported to General B. Kelley, at Grafton, whence it was ordered to New Creek (Keyser), W.
And on General Kelleys advance on Romney, took part in that expedition, and together with the Ringgold cavalry charged the enemys works. This charge was delivered with fine spirit and most satisfactory results, the whole of the enemys artillery, stores and flags being taken without the loss of a man. General Kelley, in his official report to the War Department remarks: I must be pardoned, however in calling the attention of the country to the brilliant charges of the cavalry under Captain Keys and McGee. I venture to say they are unsurpassed by any in the annals of American warfare. This advance was soon followed by the surprise of the Rebels at Blues Gap; in which the Lancers were again conspicuous, resulting in the capture of a number of prisoners, three pieces of artillery and the entire camp equipage of the enemy, and driving the Rebel forces to the eastern slope of the Alleghenies, thus transferring the field of active operations to the Valley of Virginia. Captain McGee was promoted to major of the Third West Virginia Cavalry, October 2, 1861. The several companies and battalions in the Third Regiment rendered conspicuous service. 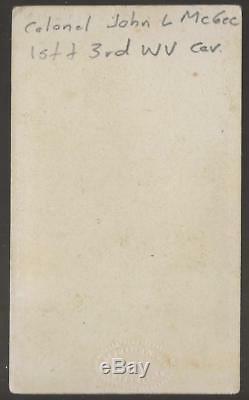 As early as June, 1862, Company C, Capt. Seymour B Conger, was attached to General Fremonts command. When in pursuit of Stonewall Jackson in his retreat up the Shenandoah Valley, Captain Conger and his company frequently engaged the enemy, and received special mention from General Fremont, upon the occasion of a splendid dash made by the company at the bridge near Mount Jackson; when the retreating enemy had fired the structure, Captain Congers gallant charge saved the bridge, and General Ashby barely escaped capture. E, displayed the qualities of the brave soldier in the vicinity of West, Sutton and Bulltown in western Virginia under General Roberts. Roane, in command of the same company, charged, routed, killed and captured many of Imbodens and Jacksons troops near Clarksburg, at Simpsons Creek and Jane Lew, in the early party of May, 1863. In the reorganization of the Army of the Potomac, January 31st, 1863, Companies A and C were detailed for special duty at General Sigels Grand Reserve Division headquarters. Company H, in command of Capt. Flesher, was at Parkersburg, from May 1 to August 31, 1863; Company G, Capt. Hayes Brigade in the Kanawha Valley. In June, 1863, Captain Conger, with Companies A and C, was attached to General Pleasantons Corps, Bufords Division, Colonel Devins Brigade, and participated in the battles of Brady Station, Beverly Ford, Stevensburg and Upperville, Virginia. A characteristic episode of the war, and one which very forcibly illustrates the estimation in which the West Virginia troops were held, occurred while General Milroy was in command at Winchester. A reconnaissance of considerable force had been repulsed with a very serious loss to our troops, and it was determined to send out a strong force to develop the full strength of the enemy. The general, looking over the detail which had been made for the expedition, remarked that he would like to have some West Virginia boys at the front of the movement. Colonel McGee, Inspector-General, and Chief of the Staff of the Division, at once volunteered to take command of the advance guard with three companies of West Virginia Cavalry, one company of the 1st West Virginia and two of the Third West Virginia Cavalry; it was so ordered, and the three companies, about 60 men all told, took the road far in advance of the main column. At Fishers Hill two Rebel pickets were observed, and Colonel McGee deployed his command sending out parties to either side, while, with about thirty men, he took up the march to the summit, which was approached by a narrow road cut in a precipitous side of the hill. When near the summit the two men in advance dashed back in perfect panic, shouting the report that they were followed by a thousand Rebs in full charge. To countermarch on this narrow road in the presence of the enemy was impossible, so the only alternative was to fight. Colonel McGee at once gave the order and with drawn sabre led the charge. Just at the summit the road turns sharply out of the woods leading thence straight away over an open plateau; at this turn the opposing Rebels were in full charge and the charge of the West Virginians delivered with such impetuosity, that the Rebel column was split and doubled back upon itself, and no more spirited hand-to-hand fight was seen during the war than that here enacted, and it was kept up with most heroic vigor until the enemy was completely routed and sent flying up the valley. It was afterward learned that the Rebel force numbered about 100 men, commanded by Major Myers, and their loss was one killed, several wounded and five prisoners; while we had two men seriously wounded, one mortally, one horse killed; the horse ridden by Colonel McGee in the charge received five bullet wounds, but the rider escaped unhurt. This they found no light mornings work. But after three days hard and continuous fighting against hopeless odds, Milroy, with ammunition exhausted, completely surrounded and cut off from supplies or communication, determined to hold a council of war. But before going to the council, Colonel McGee told the author that the general took him aside, and in the most impressive manner, told him: I have been persuaded to call a council of war. It may decide to surrender, but I will never surrender to any d____d Rebels. If the council decide to surrender, I want you to get your three companies of West Virginians together, and at their head we will go to Harpers Ferry or to hell. In narrating the incident the colonel remarked that although he had been for three days almost constantly under fire and two nights on the outpost line, he would have most cheerfully accepted the challenge, never doubting that they would reach their proper destination. But fate ordered otherwise, and the next morning the general broke the Rebel line and marched with 5000 men of his command into the Union lines. April 16, 1864, Major Lott Brown, at Buckhannon, was ordered by General Sigel to proceed with his battalion to Clarksburg, thence by river and railroad to Charleston, Kanawha. May 10, 1864, the regiment, in command of Major Conger, was with General Averell in the battle of Wytheville, Va. Averell made special mention of the regiment in this. At Staunton, Virginia, June, 1864, the regiment was assigned to Colonel W. Oleys 2nd Brigade, thence to the Kanawha Valley, under Oley and Duffie. August 7, 1864, General Averell fought the battle of Moorefield, W. The 3rd Cavalry was in command of Major John S. The fight was one of the most signal victories for the Union cause during the war. General Averell in his report of the battle says. The brigadier-general commanding congratulates the officers and men of the division upon the brilliant success achieved by their victory at Moorefield, on the morning of the 7th inst. But with out exultations is mingled a profound grief at the loss of Major Conger, 3rd West Virginia Cavalry, who found death as he had always wished, in the front of battle, with heart and hand intent upon the doing of his duty. Brave, steadfast and modest, when he fell this command lost one of its best soldiers, and his regiment and general a friend. The men who followed him in the charge will never forget his glorious example, or that of the gallant Lieutenant Leonard Clark, who fell by his side. In the reorganization of the Army of West Virginia, August 31, 1864, General George Crook, commanding; General Averell, commanding division; Colonel Wm. H Powell, commanding the Second Brigade, in which the Third West Virginia Cavalry was a part under command of Major Lott Bowen. And still later, on the 19th of September, the same organization was preserved except the Third Cavalry, which was commanded by Major John S.
Witcher, and Colonel Henry Capehart, commanding Second Brigade. At the battle of Fishers Hill, September 22, Lieutenant-Colonel McGee was in command of the Third Cavalry. On September 23, 1864, General Averell was succeeded in command of his division by Colonel Wm. During the months of January and February, the Third Regiment under Lieutenant-Colonel McGee, were stationed near Winchester, Va. Doing picket duty, making frequent reconnaissances up the valley. On February 27th, the regiment broke camp and moved with the cavalry corps commanded by Major General Sheridan up the valley to Staunton, and participated in the battle of Waynesboro, Va. On the 2nd of March, defeating General Early, and pushing on the same evening to Greenwood Depot. The next day the command moved to Charlottesville, and thence with the command of General Sheridan on his great raid, which resulted in the destruction of more than fifty miles of the James River Canal, many miles of railroad, besides other public property. The command arrived at White House on the 19th of March, where it remained in camp until the 24th, marched thence via Charles City Court House, and crossed the James River at Deep Bottom. On the morning of the 1st of April, a desperate engagement took place, in which the Third Cavalry bore a conspicuous part. On April 2nd, at Fords Station, the Third Regiment, under Lieutenant-Colonel John S. Witcher, charged and drove a brigade of Confederate cavalry, killing the Confederate General Pegram. The regiment continued to do duty in all the exciting and closing scenes terminating with the surrender at Appomattox on the 9th of April. The regiment lost during the war in killed and died of wounds, six officers and forty enlisted men; died of disease or in prison, one hundred and thirty-six. The item "Civil War CDV Colonel John L McGee, 3rd West Virginia Cavalry" is in sale since Monday, August 13, 2018.